Girl robots? Saving the day? WHAT IS THIS MADNESS?! Sarcasm aside, I'm not too overly impressed with the cover. And oh god, it looks like Quake Woman is going to be a regular. Joy. What the hell is Roll gonna do? Throw a broom at them? When has she ever appeared and not been a joke character? Remember how good the first few covers were? Is this even the same artist? Well, I personally, am looking foward to this arc. Sounds like a lot of fun with our favorite fem bots :D Haters gonna hate, I guess. :P I guess I am not really one to talk, though, since I am not too thrilled about the crossover with Sonic, but meh. Just my most humblest of opinions. That's because it's not the same guy. Hiring Spaz for everything is expensive and he is already overworked. The other guys are perfectly fine. The cover art this time COULD use some fixing up but it's a monthly publication and not all of them can be winners. We WARNED you Archie has a history of introducing a ton of original characters and keeps shoving 'em in your face. You should be glad right now Archie Mega Man only has three, just try and look Sonic's sometime. I like the mix up of order in Robot Master debuts. Brings up some interesting team ups/scenarios, all the while making us guess if they will actually follow the ingame storylines or not. I'm already trying to figure out when Bass will debut and if the Megaaman Killers will debut at all. Besides aren't the 9 robot masters all Light machines? Meaning they could be created at any point of time since it was never specified in game? I like Roll alot, so this should be neat. And it's cool that they're using MM9 bosses too. Well at least Quake Woman's pretty decent. Not exactly a very Robot Master-y design, as the main body of the bot normally reflects their attack style more, but close enough. @July 13, 2012 10:06 PM Anonymous: I wasn't saying that I was surprised that Quake Woman was becoming a regular. I know what Archie is like, and I am hardly surprised. I was just expressing more sarcasm. Roll! Roll is there!! And... so is Splashwoman. And Quakewoman. ... hrrrrrn. Also, I actually like Chad Thomas' artwork, to be honest. I actually sorta like it more than Spaz', the more of it I see. Spaz tends to have very... stiff poses for the characters he draws, but Chad Thomas gives the characters more organic, natural poses. And before anyone mentions "they're robots" or whatever, I noticed this for the human characters, as well. Also, come on. Chad Thomas draws THE BEST Dr. Wily ever! Oh no folks, the gods bloody forfend that the cast be expanded, Roll be given some actual agency as a character and Archie give us plots other than simply plodding through one game adaptation after another. I think Chad needs to learn how to draw cuter women. That being said, other than that I really love his art, his improvement over the first sketches he had is amazing, and I'd certainly like to see more of his stuff. I hate to say this, but Archie has an unsettling obsession with female characters, especially their OC's. If we're not getting a quality story or quality art, there's little reason to buy these comics beyond the title. I'm sorry, but I had hoped Chad Thomas would get better at this with time, this cover suggests he's gotten worse. What the heck is wrong with Quake Woman? What is right with Quakewoman? @taichara: Oh don't give us that crud. New cast and new stories are fine and dandy every once in awhile, but only if it's done right. And given Archie's history, I do not think it will be done right. I'm more bugged by the cover art than anything. Frankly, I liked Chaz's 2nd and 4th cover sketches more than the final one here. @Prof. MegaMan: Must you call them "OCs"? Calling them that puts them on the same level as characters made up by fans, when they're nowhere near the same thing. Whether you like them or not, the Archie comics are officially licensed by Capcom, so any characters introduced in said comics are official characters. Maybe they're only canon to the comics, but the comics themselves are just as legitimate as any game, cartoon, or other official product. @Anon above Dr. Jerk: There isn't that much of Quake Woman shown so far, but she seems like an interesting character with a unique origin that I don't think has ever been explored in Mega Man before. But she wasn't introduced in the games, so she MUST be the most horrible thing ever, right? @Dr. Jerk: What does Archie's history have anything to do with the current writer? So far, outside of a few pacing issues that are being addressed, the writing for Mega Man has been pretty amazing. Granted, it's not on Hitoshi Ariga's level, but that's a pretty high mark to aim for. As far as American comics go, this is actually one of the best ones on the newsstands, and the current writer for Sonic the Hedgehog (and Mega Man) doesn't have any strikes against him like his predecessors do. Saying things can turn sour under him because he's working at Archie is like saying a Mega Man game could turn sour because Keiji Inafune was working at Capcom (when he was, I mean). Hell, for that matter, I can easily say that Capcom's history was great, and their old stuff is amazing, but nowadays they've really been sucking. That's a good example of how a company's history isn't the best thing to go by when expecting something in the present time. 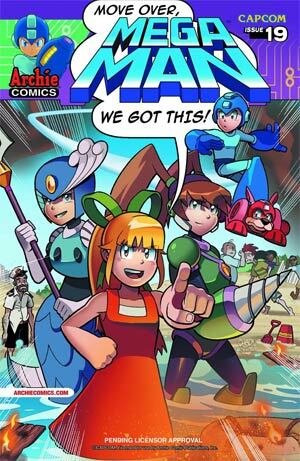 The Archie Sonic comics may have been pretty terrible at one point in time, but recently they've been pretty good, and Mega Man has been a pretty enjoyable comic, as well. As for Chad Thomas' artwork, I don't really see a problem with it. Honestly, I like it a lot more than Jonathan Hill's stuff, and sometimes even Spaz's (I think Spaz should stick to covers, as there's too many noticeable things in his art that bug me when it comes to his interiors). This particular cover isn't bad, and to be honest, the minor problems with the faces seem to be the fault of the inker, if you ask me, as the sketch version of that same cover looks fine to me, in that regard. "the current writer for Sonic the Hedgehog (and Mega Man) doesn't have any strikes against him like his predecessors do"
Iron Dominion. One of the most disliked story arcs in the Sonic comic which was his creation. Flynn is good quite often but saying he's PERFECT OH MY GOD GUYS STOP QUESTIONING HIM :( is just wrong. @July 14, 2012 10:58 PM Anon: Wasn't the Iron Dominion arc an early story of his? Not that I'm saying he's perfect; there's a couple of things in Archie-MM that annoy me (invoking something similar to the Three Laws instead of having Elecman hesitate to fry Simone because he didn't want to "prove" the ES right). Not anything as bad as Ken Pender's incompetence, just annoying. @Clown Prince of Crime: "Maybe they're only canon to the comics, but the comics themselves are just as legitimate as any game, cartoon, or other official product." Excuse me for a second, lol'ing right now. I think most can agree that most carnations of the series should be canon in their own 'verse only, which you already mentioned. Sure the Archie comics are indeed 'official' comics, given that they were licensed by Capcom. But that's just what they are, official comics that have no bearing on other MM carnations and nothing more. Unless characters such as Quake Woman is used in MORE carnations of MM, which is a very unlikely thing to happen, then I think she should only be canon to the comics and not necessarily a true official character to the franchise as a whole. And say what you will, but I still stand by my opinion. @Dr. Jerk: Quakewoman isn't a "true official character"? If Capcom gives someone the license, then it's official. Saying that Quake isn't "truly" official kinda puts her and the comic on the same level as the Protomen and the Lebron film--acknowledged by Capcom, but not really supported. Yeah, it probably wasn't what you meant, but that's how it came off to me. Ian started writing for the comic in Issue 160. Iron Dominion started in Issue 201. If you want to define that as "early" then you might as well say he's still the "new guy". @July 15, 2012 11:44 AM Anon: Oh. :/ Shows what happens when I stop keeping up with Archie-Sonic. Carnations are flowers. You mean "incarnations." And the Archie comics are just as official as Ariga's stuff. Roll might swing a broom as needed but she might have other skills like planning, cunning, etc. Although she's a robot she have emotions just like Rock so, she possibly can feel of getting bored and needs something new to revitalizing herself so, she must have her other life stories than the boring daily life like every morning she cleans the house and makes breakfast; stays in the hitchen making lunches and sandwiches for them and in evening cleaning and drying dishes and clothes everyday. so when does she ever leave the house and go alone elsewhere or does she ever leave? EVER? This Capcom hasn't told more about her for 24 years. I remember the plot and at least one detail of where she was forced in the middle of the chaos at the shopping mall to evacuate people away from (whether this was true), then once she built a decoy with old-style mop to look like herself to mislead the three baddies, and hold them until she gets help. Excuse me, I was very tired when I wrote that comment. Yes, I did meant incarnations. Let me rephrase it then. Archie's comics, Ariga's manga, the cartoon, the various anime works, and such things, are official adaptions. Official yes, being that they were licensed, but still adaptions. WAH! What happend to the cover art! That looks MEGA BAD!